My friend Sue and I met Nan from Georgia during the 1976 Montreal Olympics. We were all sitting on the grass waiting anxiously for a glimpse of the Royal Family as they boarded the Royal Yacht Britannia. As we sat there, we talked and became fast friends. After 31 years of keeping in touch, we decided it was time for a reunion. Nan drove north from Georgia and we met for 4 wonderful days in Ontario. We talked, ate, visited a spa, toured and talked some more. 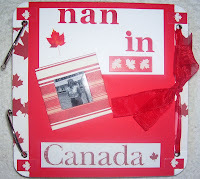 To honour our friendship, I made my first ever photo album as a gift for Nan. The first few pages included pictures from 1976 of the three of us. 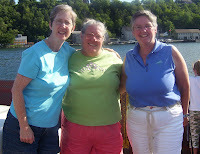 I left lots of room in the second half of the album for pictures of the three of us from 2007.